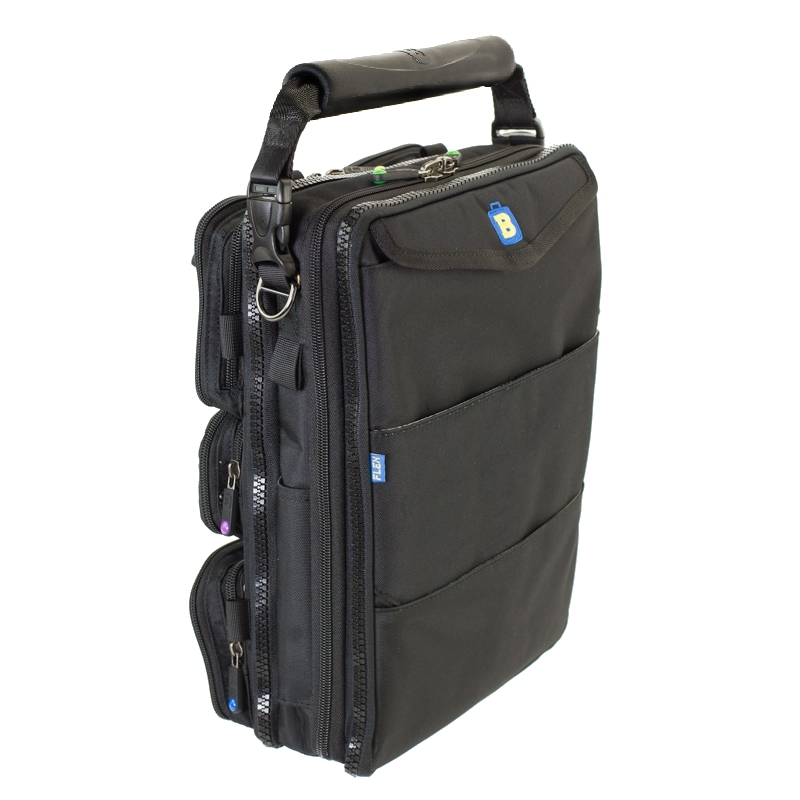 The B2 COMPUTE is the FLEX System "computer bag" and is perfect for anyone who wants a small, efficient way to carry their 13” laptop along with all the associated essentials. Or, it can serve as a compact document bag, or a lunch bag, or it could even carry a single change of clothes. The CS2 provides, you guessed it, two inches of storage depth, but keep in mind that there is also two thin flat storage areas BETWEEN the three modules. (Remember, it is a soft bag so it can expand slightly in every direction.) Keep in mind also that you can add any other Center Section to the B2 (like zip a CS4 in between the CS2 and the FCR) to add more storage on certain days. Any FLEX System module can zip onto any other FLEX System module. The Main Compartment of the CS2 in the B2 has locking zipper sliders. 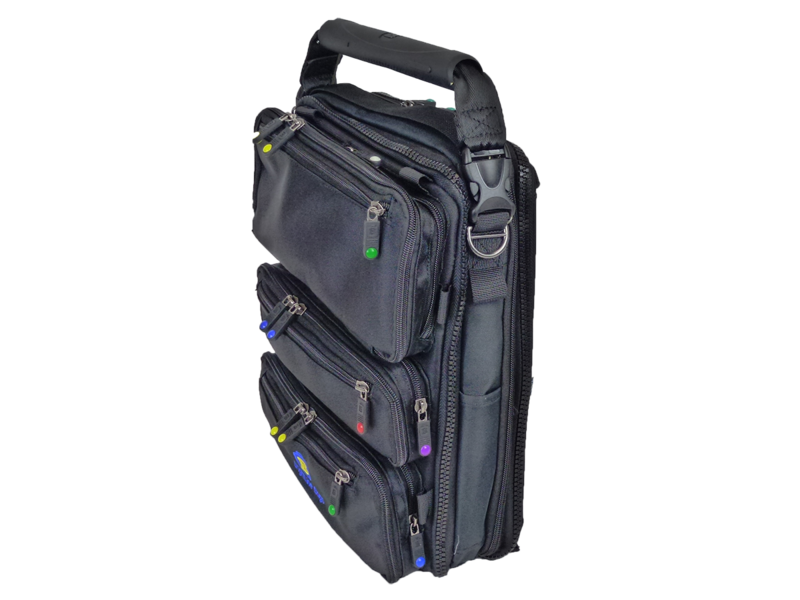 This configuration will very commonly be used to carry a 13" Laptop along with an iPad (or other tablet) and some additional documentation. But it might also serve as an ultra narrow VFR flight bag if you happen to have the compact in-the-ear type of headset, or a headset where the ear cups fold flat. It's also a great commercial carry-on bag, or an outstanding daily personal bag (also known as a "man purse"). Storage on the B2 starts with the POCKET CAP FRONT: The POCKET CAP FRONT acts like the "hub" for your entire FLEX System. No matter which configuration you carry you'll be attaching the POCKET CAP FRONT to one end of your bag. And it's the "hub" because it holds all the important small stuff and tech stuff and personal stuff that you want with you no matter what. If you change configurations, you'll always move the POCKET CAP FRONT to the new configuration which means you'll always have all this key stuff with you, without any repacking or reloading. Next, comes the CS2 (2-inch Center Section), which is designed to hold 13” laptops or a small collection of documents (or both). (Many, but not all, 14" laptops will also fit.) The CS2 can be accessed by unzipping the two zippers to open the entire rear panel, giving access to the gray interior. The Main Compartment of the CS2 has locking zipper sliders. NOTE: Many of the photos show a small one-inch webbing strap going across the very top of the module. This strap has been removed. It is no longer part of the bag. We removed the strap because it was left over from the pre-FLEX days and it is no longer needed as a secondary handle. We just didn't want to go through all the trouble of reshooting all the photos just for this minor change. We hope you understand. The FLAT CAP REAR module offers two flat pockets on the outside, and one flat half-height slip pocket on the inner surface of the module. The primary outer pocket is accessed from the top and has a cover flap that is secured with Velcro. This where you'll likely store your iPad (as long as it's not in a thick case), or a manilla folder or two for some documents, or a magazine. There is a second flat panel that covers two-thirds of the outside of the main panel that is broken into two halves - an upper panel and a lower panel. By default, the bottom edge of the upper panel is "tucked" into the top edge of the lower panel. 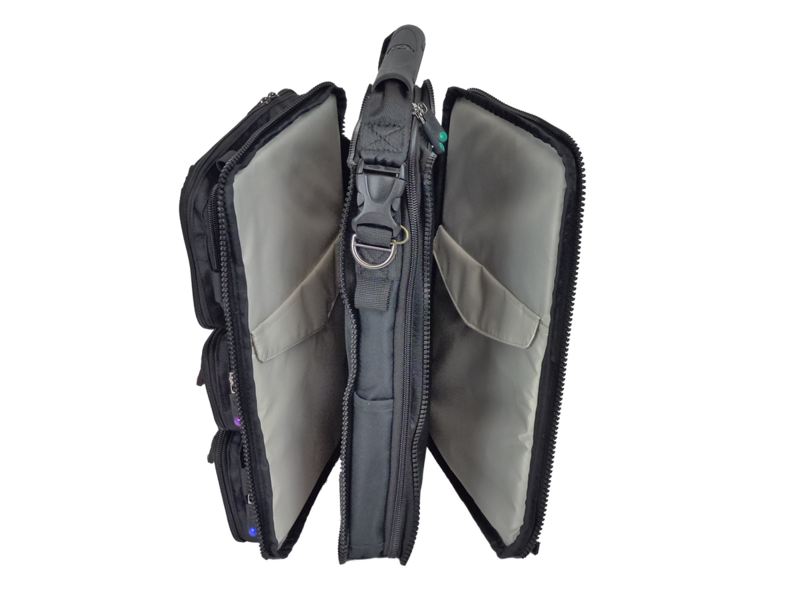 This allows both panels to act together as a single slip pocket that works great for sticking a boarding pass or other simple paperwork here. If the top panel is "untucked" from the bottom panel, this allows the telescoping tubes of a suitcase or folding cart to pass through and the panel serves to secure your bag to those tubes (especially when this FLAT CAP REAR is attached to other modules to form bigger bags like the B2 COMPUTE, B4 SWIFT or the B7 FLIGHT). Then, when you're done putting your BrightLine Bag on top of your suitcase, you can just "tuck" the top panel back into the bottom panel and it becomes a slip pocket again. The B2 COMPUTE comes with a Main Handle and a Shoulder Strap. It does NOT come with the SLIM HANDLE KIT.